These are nice little dim sum pastry balls great with a cup of Chinese tea. I am using traditional Chinese flaky pastry for this recipe but if you can't be bothered you can use bought puff pastry. Chinese flaky pastry is made up of two type of pastries layered together. Here is how to make this yummy dim sum. 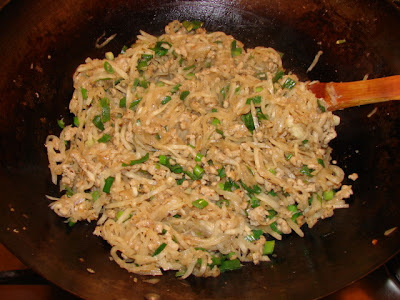 Heat oil then add garlic, stir fry till fragrant then add dried shrimps and stir fry for couple of minutes then add pork, continue stir frying till pork is cooked through and no sign of liquid left. Add soy and pepper to taste. Then stir in the mooli, stir fry for few minutes till the vegetable is soften, add enough salt to taste and stir in slackened cornflour. Heat off and add spring onion. Leave this to cool while you make the pastry. This pastry is versatile can be used in many pastry type dim sums , savoury or sweet, baked, pan fried or deep fried. *If you don't like lard or vegetable shortening, you can try using butter for both pastries. It's not traditionally Chinese but will be tasty too. To make the water pastry a, mix all ingredients (except flour) together stir till sugar and salt is melted. Add this liquid gradually into the flour while mixing. Mix till all dried flour is absorbed. Depending on the type of flour you have and room temperature, you may need more all less the total liquid. If the dough is still a bit dry after adding all the liquid, add a touch more water. No need to knead. Leave the dough to rest for about 20 minutes. After resting give it a quick knead till smooth and leave aside for 10 minutes before dividing. To make pastry b, just mix fat and flour together till you get a lump of greasy dough. Divide the both doughs equally into 19 - 20 parts each. Take a piece of water dough, flatten this and put on a lump of the greasy dough. Wrap this up. Flatten and roll out into a long strip. Roll this strip up like a cigar. Turn 90 deg., and roll out this little log into a long strip again, roll up like a cigar again. This is how to create multi layers combining these two pastries. The pastry is ready to use. I normally repeat step 4 till all other bits of dough (water and oily) are combined before wrapping with filling. Cover to avoid drying. If using lard and working in a cool or cold kitchen, lard can harden the pastry quickly, so better cover with a towel wetted with hot water and wring out dry. To assemble the pastry balls. Take a piece of flaky pasty dough (see above), try and roll it out as round as you can to about 2 - 2.5 mm thick. Wet the rim of the pastry with water. Spoon on some filling. Then start gathering the edge together and wrap like a Chinese bao bun (see slide show). Then when sealed, lightly wet the surface and smooth the rough edges, shaped into a ball with the base slightly flatten. Continue wrapping all other pieces of dough till all done. 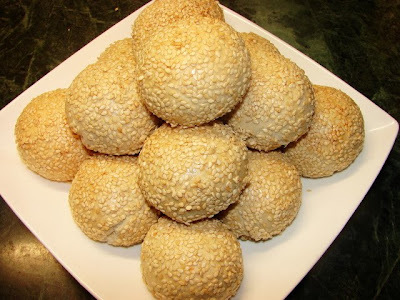 Brush the pastry balls with beaten egg then roll with sesame seeds. Place balls on a baking tray/pan. If using no non-stick tray, grease the tray/pan with a little oil. Preheat oven to 200 - 210 deg C.
Bake the pastry balls for about 20 minutes till golden. Thanks for the tips. This is the first time I have a very good idea of how this is made.